One of the big problems in America today is that a lot of people simply do not seem to care about what they are doing anymore. The level of sloth, laziness and apathy that we are witnessing in this country is absolutely mind-numbing. Of course this is not true of everyone. There are still many Americans that are extremely hard working. But overall, it really appears that people are not taking as much pride in their work as they once did. Some of the examples that I am about to show you are quite funny. Others are more than just a little bit disturbing. But they all have a common theme. Americans from all walks of life are simply giving up. Whether they are teachers, delivery people or fast food workers, the truth is that there are a whole lot of people out there that seem to have mentally checked out. To be fair, there is a tremendous amount of debate about this photo on the Internet. Some people insist that no teacher would ever be so careless and that this picture must have been photoshopped. Others that have studied this photo insist that there is no sign of alteration and that it is 100% authentic. I will let you come to your own conclusion. What is undeniable, on the other hand, is that there are a lot of delivery people out there that simply do not seem to care anymore. What would cause someone to act like that? What has caused so many Americans to no longer take any pride in their work? Another place where this can be seen frequently is at fast food restaurants. I don’t know about you, but to me that is absolutely disgusting. Needless to say, that worker quickly lost his job. 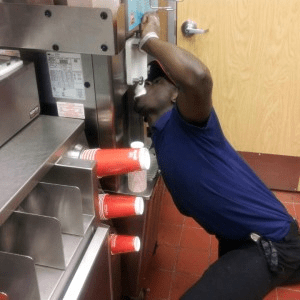 And of course there is no shortage of other fast food horror stories out there. Tony Hill, a pastor in Baltimore, Maryland, once got a deep-fried mouse along with his chicken at Popeye’s. The old “I found a rat in my fried chicken!” urban legend is decades old – this particular story was given a little credence, however, by the fact that local health authorities confirmed that the Popeye’s in question had a rodent problem. These days even the criminals are getting lazy. The following story is very tragic. Violent crime in America is on the rise, and as the economy continues to get worse people are going to steal just about anything that is not bolted down. A Denison man told investigators that he and another man shot two people, then set fire to a trailer with the victims inside, according to court documents. Jayden Chapman said he and Michael D. Schenk shot Marvin Huelsing, 80, and Alice Huisenga, 81, on Monday, according to a criminal complaint and affidavit filed in Crawford County District Court. This is the kind of thing that we are going to see a lot more frequently in the years ahead. A pickup truck more than 200 yards north of the trailer also was burned. Near it, investigators found on the ground a receipt from the Denison Walmart with a debit-card number from a food-stamp card. Authorities determined the card was assigned to Schenck. In this case, justice was served by the slothfulness of the American people, and I hope that those murderers are given the highest penalty allowed by law. The government controlled public education system has flourished beyond all expectations of your owners. We’ve become a nation of techno-narcissistic, math challenged, reality TV distracted, welfare entitled, materialistic, gluttonous, indebted consumers of Chinese slave labor produced crap. But even though so many of us are aware of what is happening to us, we just can’t seem to break out of it as a nation. It really does seem like most people are walking around in a fog these days. Maybe the fact that 70 million Americans are on mind-altering drugs has something to do with it. But unless Americans start taking more pride in their work again and start living their lives with meaning and purpose, it is going to be very difficult to envision a positive future for this country. So do you have any stories similar to the ones in this article to share?